The Blot was thrilled to learn Diamond Select Toys is continuing its popular Walgreens exclusive line of Minimates mini figures based on the Marvel Animated Universe! 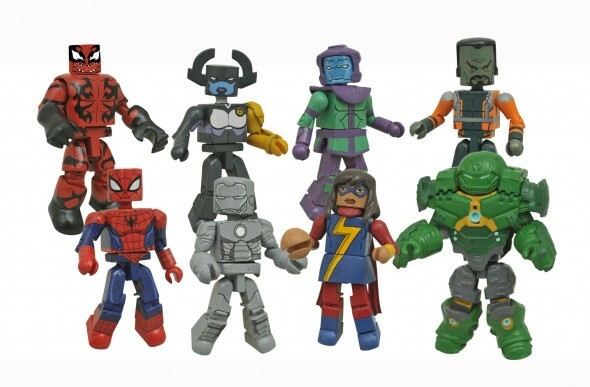 With Series 4 in Walgreens locations nationwide now, it’s exciting to learn Diamond Select Toys will be continuing the line with Minimates 2 Packs based on Marvel’s popular animated Television shows Ultimate Spider-Man and Avengers Assemble. 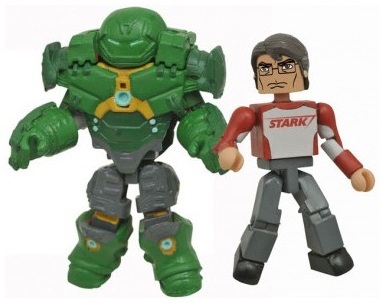 The Walgreens Exclusive Marvel Animated Universe Minimates Series 5 will feature four 2 packs: Spider-Girl with Hulk Carnage, Ms. Marvel with Kang the Conqueror, Iron Man Mark II with Proxima Midnight, and Bruce Banner in Hulkbuster Armor with The Leader. Each Marvel Animated Universe Minimates Series 5 Set includes two 2” mini figures featuring 14 points of articulation and a variety of interchangeable character specific parts and accessories. Look for this new series to arrive in Walgreens stores on July 1, 2017 and retail for between $10-15.